As the number of advanced options have increased (common trusses) the user input menu has slowly grown in size until it is so large that it often does not fit the screen of many laptops and smaller screens. This problem has been well documented by a number of users for quite some time. I still need to work out the metric version and also all of the language translations but otherwise I think it is almost ready to roll out. As you mouse over each of the options a 320x240 image will display as shown, hopefully clarifying the meaning or usage of each parameter/option. I am working on adding the heel blocking since it is an option listed in the advanced options. So far there has not been much call for this feature but a few people have inquired so I figured we might as well add it in for completeness. The red coloration is for clarity in the image above. I will probably add the option to allow for venting holes since this is fairly typical in my neck of the woods. The license registration module was causing some problems in isolated cases so I've released a sub-rev. 2.1.1b to address that issue. If you are trying to enter in your serial number and it does not appear to take, first verify that you are not entering in any leading or trailing white spaces if that does not solve the problem you may be encountering the issue at top, in that case download the latest version which should address the issue fully. 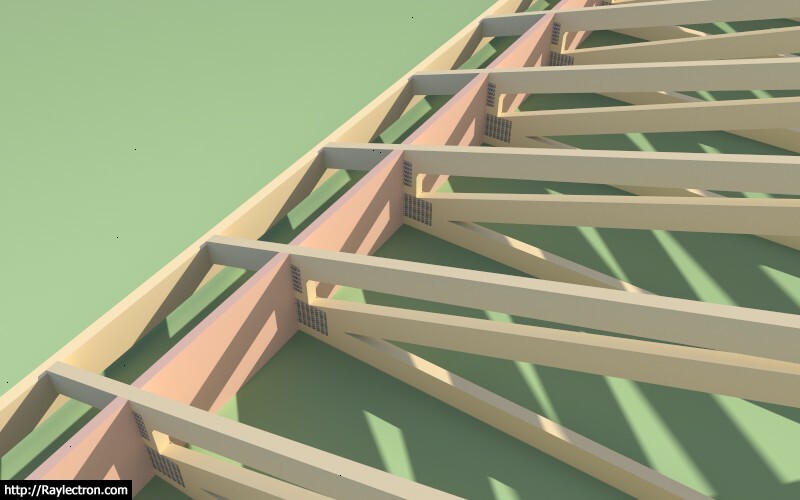 - Enabled vertical and angled heel blocking within the advanced options for truss roofs. Let me know if this makes sense, I can always modify it to meet any criteria. If this sort of thing varies a lot per locale I can also make it more user definable. I've seen them mounted both on the exterior and the interior with the flanges facing both inward and outward, four possible configurations. Any preference on how these are typically installed. I'm sure there is probably not much call for these but it isn't a big deal to add in the option for those that would like to use it. I am currently featuring Simpson Strong-Tie hardware in the Truss Plugin, not because I am specifically endorsing their products or the brand but because that is what I am most familiar with and their products are readily available in the US and Canada. Mitek also makes comparable hardware and probably has better availability outside of the US and Canada. The plugin is now able to insert hurricane ties. I've currently set it up so that they are installed on the exterior of the framed wall with the flanges inward. Shown below is a Simpson H1 with angled vent blocks. 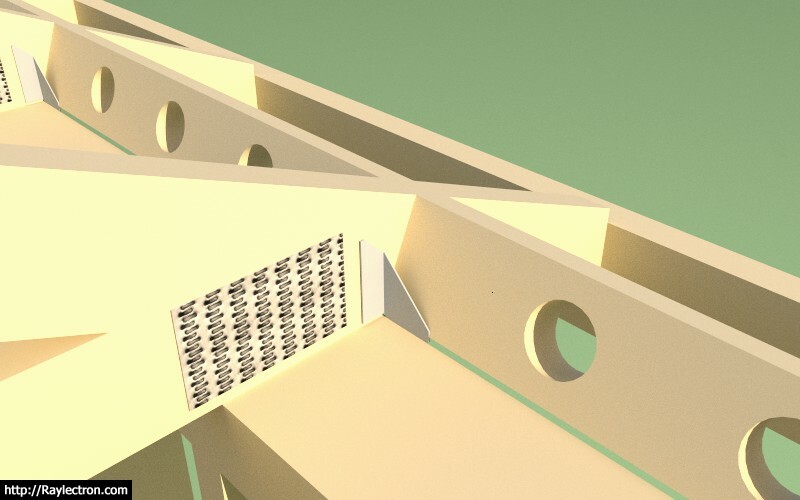 Here is an example using the Simpson H10A with vertical heel blocks and a raised heel truss connected to a masonry or concrete wall. Ignore the vent holes in the blocking, I will provide additional options for venting in the near future. Note that plugin automatically inserts these ties into the truss component, one on each end. The simplified H10A component is based on the official Simpson model found at the 3DWarehouse and is dimensionally accurate but with a much lower polygon count and hence much more lightweight. Here is an example using the Simpson H2.5A hurricane tie. The upper tab is facing outward by default. The tie on the other end of the truss is positioned on the opposite of the truss to this one. I will roll it out for trusses first and then rafter roofs at a later date. I've specifically created simplified, lightweight versions of the hardware, so that the polygon count is minimal. With so many components I think it is imperative that the model is carefully constructed so as to minimize its polygon count and keep it as lightweight as possible. 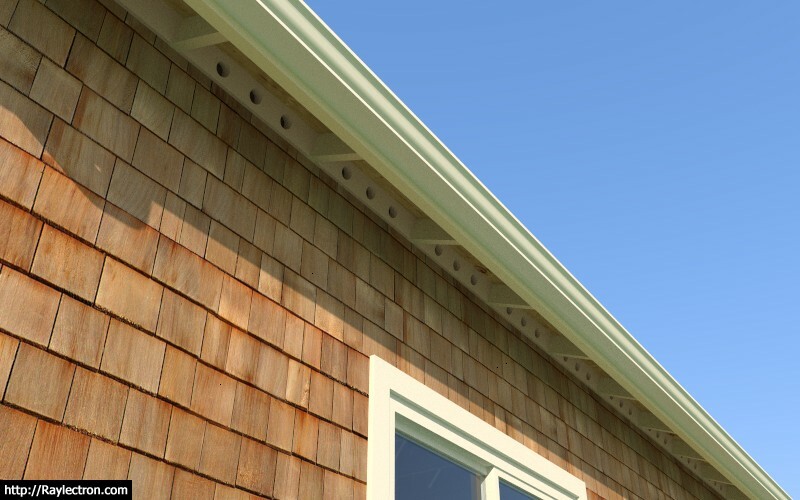 - Enabled hurricane ties for fink and howe common trusses. List of material suppliers and vendors featured in the Medeek Truss Plugin. The last few days I've been spending some time tightening up the code for the attic truss module. I will be adding in the heel wedge and slider option for raised/energy heels for this truss type as well as bringing it up to speed with other options. If I get ambitious I will also add in gable end trusses and plates. - Completed energy/raised heels for attic trusses (2 variants: wedge and slider). 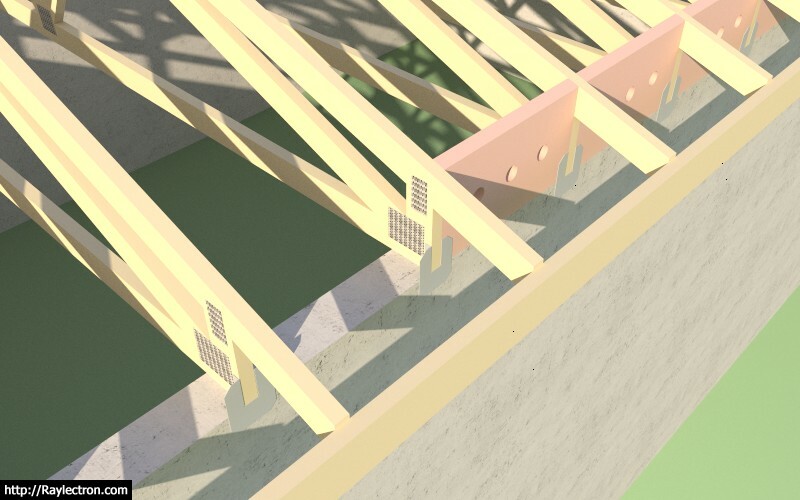 - Added floor sheathing and attic gypsum for attic trusses. 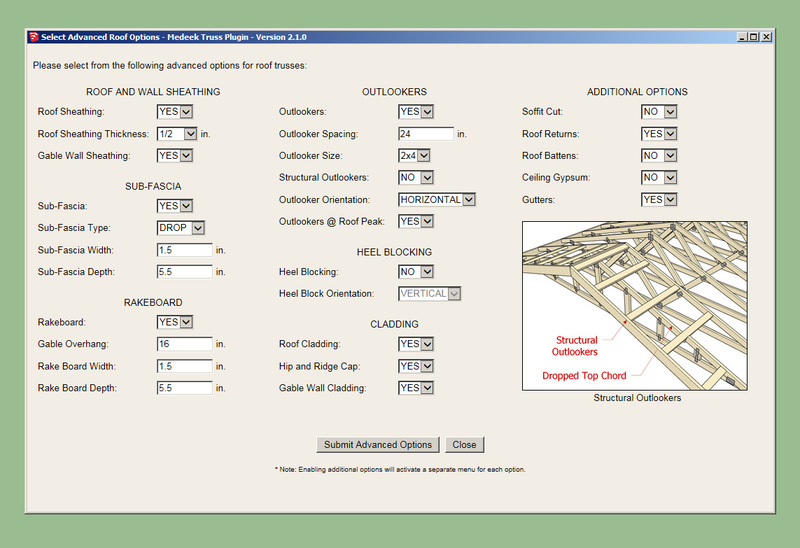 - Created a separate HTML menu for advanced options of attic trusses. 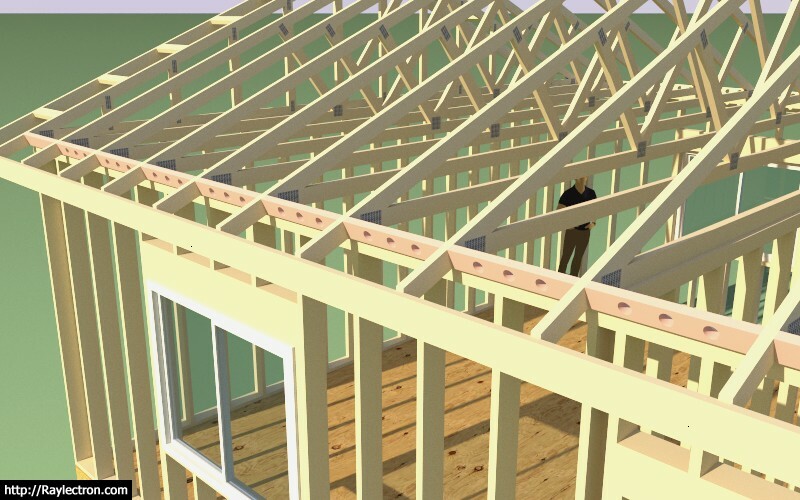 - Enabled gable end trusses for attic trusses. 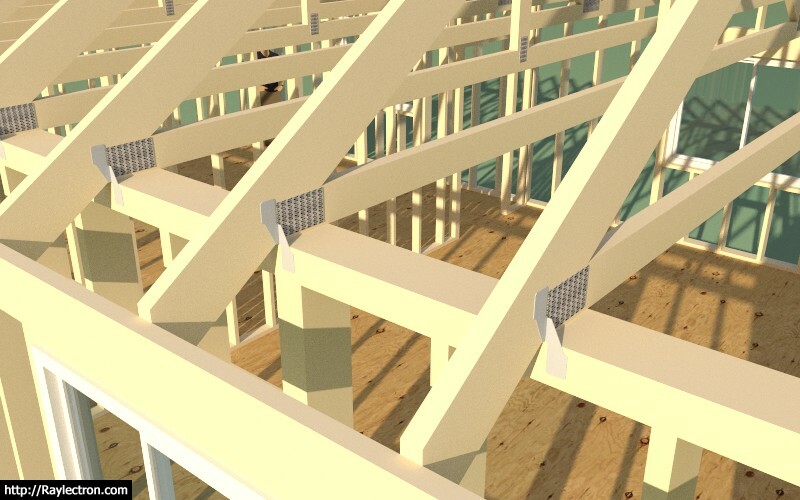 - Hurricane ties enabled for attic trusses. 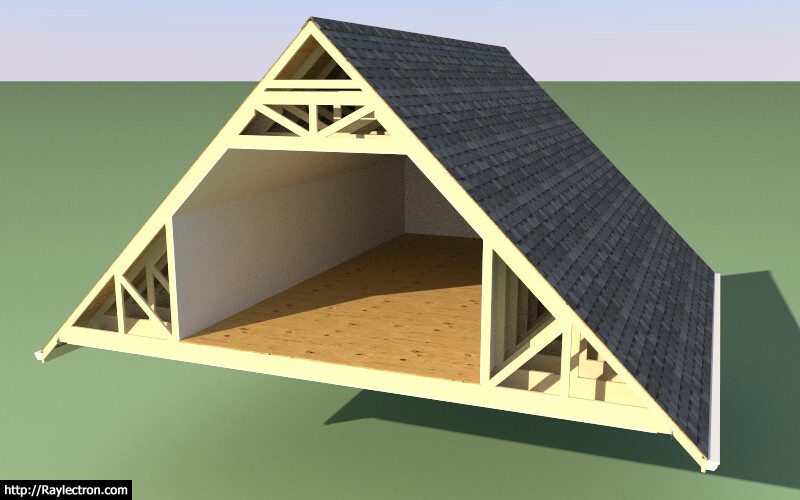 The gable end trusses for attic truss sets currently do not have any vertical studs as of yet, however the actual truss component is unique and different from the common attic trusses. I also need to add in some logic for the gable end wall framing which is still absent. I am curious if anyone has experience or examples of this framed out, do you use a single or double top plate? I don't see a reason to use a double top plate in this situation. Naturally the gable end wall may involve some windows or doors so there will be some overlap with the wall plugin, I am still thinking about how best to integrate the two plugins. Had to take a break from programming for a few days because of family reasons (ie. medical emergencies), sometimes life happens. The break though has let me take a step back and reconsider some of the items on my various "todo" lists. I'm beginning to realize that the plugin has quite a following in locations other than the US so it is imperative that the metric menus are fully up to speed with all of my imperial menus and options. I will be going back through my code and checking all of the metric menus to make sure that they are up-to-date and fully functional. I was really quite impressed by the complexity of the model and the various roof lines. This model is just one of a number of iterations.